strongest August historically in terms of sales. The Fraser Valley Real Estate Board processed 1,879 sales of all property types on its Multiple Listing Service® (MLS®) in August, an increase of 10.9 per cent compared to the 1,694 sales in August of last year, and a 3 per cent decrease compared to the 1,937 sales in July 2017. Of the total sales processed 470 were townhouses and 548 were apartments, together representing 54% of market activity in August. "It's not surprising to see demand like this still so late into the summer; the Fraser Valley has never been a better place to live than it is now," said Board President Gopal Sahota. "Our communities are thriving, and there are still affordable options throughout our region. Also, it doesn’t hurt that removing the bridge tolls gives us even greater access to the Lower Mainland." 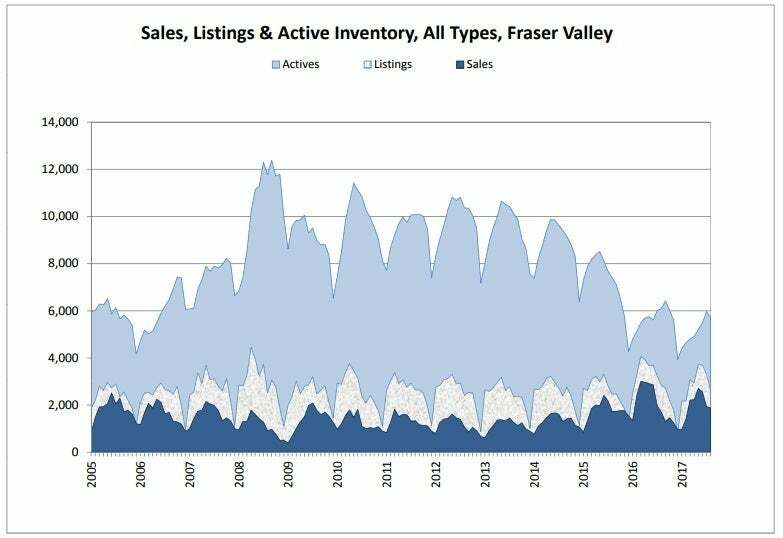 Last month the total active inventory for the Fraser Valley was 5,712 listings. Active inventory decreased by 4.3 per cent month-over-month, and decreased 6.4 per cent when compared to August 2016. The Board received 2,633 new listings in August, a 20.2 per cent decrease from July 2017, and a 7.3 per cent decrease compared to August 2016’s 2,840 new listings. increased 1 per cent compared to July 2017, and increased 10.2 per cent compared to August 2016.
compared to July 2017, and increased 16.6 per cent compared to August 2016. • Apartments: At $349,300, the Benchmark price for apartments/condos in the Fraser Valley increased 2.4 per cent compared to July 2017, and increased 32.8 per cent compared to August 2016. The Fraser Valley Real Estate Board is an association of 3,482 real estate professionals who live and work in the BC communities of North Delta, Surrey, White Rock, Langley, Abbotsford, and Mission. The FVREB marked its 90-year anniversary in 2011.